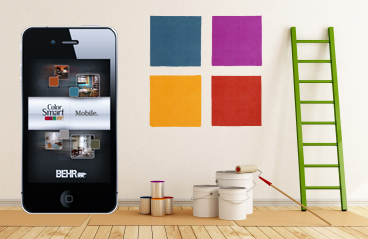 The Behr ColorSmart App is an easy way to find paint color combinations for any room in your home. You can choose your colors and then see what they look like on the wall of a simulated room. Choose from one of eight color families: ROYGBV, white or brown. On the next screen, select either pure, muted or shaded, and then pick one of the 56 colors underneath. 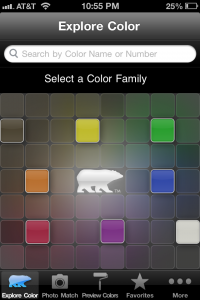 In all, the app gives you 168 colors per color family – 1,344 colors in all. When you pick a color, you see its Behr name and number, so it’s easy to go to the store and ask for it by name. We ended up with Lipstick 170B-6 (which would be a great name for a sassy spaceship). 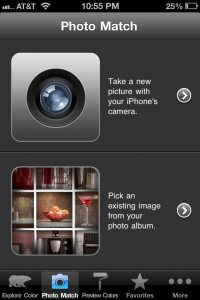 If you’re out and you spot a color that you need to have, you can use the app’s photo match tool. Just snap a picture, tap the color in the photo that you want to match, and the app will serve up three colors that are the closest to it. It’s not exact, but it’s pretty good. For a yellow Post-It note, the app offered Lime Lollipop, Asparagus and Grass Cloth. All of these are a bit greener than a Post-It, probably because of the photo’s lighting. Be sure to capture your colors in natural light. Next, you get to choose one of eight coordinating color palettes: You get two choices each for subtle blends, warm tones, cool tones, or complementary. Each palette has three colors plus white. It would be nice to be able to pick each color individually, but you can’t. Once you pick a color, you have to go with one of Behr’s tasteful yet unfunky palettes. Now it’s time to paint. You can choose from a bunch of bare white rooms, like the “French Country Bedroom” or the “Casual Dining Room.” After you select a room, its picture appears with your color palette below. Just tap the color and then tap a spot in the room, and the walls instantly come to life. 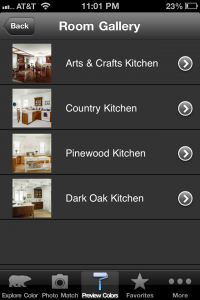 You don’t have to be overly accurate with your taps – the app sections the room into two or three areas and automatically fills them, making it easy to paint within the lines. In the Casual Dining Room, for example, you can paint the wall, the crown molding, and the rest of the molding with one tap each. You can also save your favorite colors, palettes, or painted rooms. You can use the paint calculator to figure out how much paint you’ll need for each room in your home. You can save your ideas in the Behr Workbook (login required). And of course, you can share your creations on Facebook or Twitter. Final Thought: Choose this app to try out safe, smart color combinations without staining your clothes.